The tent remains the most popular choice for campers but these days, many people try using a hammock instead. Hammocks are usually less expensive than tents but more comfortable and more lightweight. The experience of sleeping with an open view to the sky above is really exciting. There are several types for outdoor adventures and the little guide below will help you understand about each type to choose the right one for hammock camping. Parachute nylon hammocks are affordable products. Durable and resistant, they are suitable for campers who need to sleep out for several days in a row. They are available in single and double models. The single model is ideal for a single camper while the double model has enough space for two people to seat. While two people can sleep in a double parachute nylon hammock, it is in fact not recommended because of inconvenience. It is more suitable for someone is very tall or prefers a wider space to sleep. The double model comes with extra width and, of course, more weight and cost. If you use it when camping in a cold and wet environment, your feet and shoulder are less likely to be exposed in your sleep. Of all types of hammock, it is the lightweight option. It is made from very lightweight and durable materials without scarifying the comfort and quality. Small-to-average sized campers can sleep comfortably in such hammock without any problem. This type of compact hammock is ideal for professional backpacker, hikers or those who embark on a quick and spontaneous camping trip with a long travel distance. It is very easy to carry out and set up. As the name suggests, this type of hammock is suitable for expeditions and long trekking/hiking trips. It is usually made of thicker nylon with good quality, making it more durable than other types. It also comes with various features to give user the best convenience and protection like built-in mosquito/bug net, rainfly, guy-lines….. The convenience it brings comes with a price: compared with the first two types, expedition hammock is considered more high-end; plus it can be quite heavy. Between the two, it is the more popular camping hammock design. The name comes from its two distinctive features: the ends are gathered into a bunch and the hammock shape is an asymmetric. Camper can lie down diagonally in a rather flat sleeping position. There is not a lot of equipment to support the hammock’s shape; therefore it is very lightweight and makes the camper feeling comfortable when sleeping. This type of hammock has flat ends which are reinforced with spreader bars, creating a shape like an open tube. 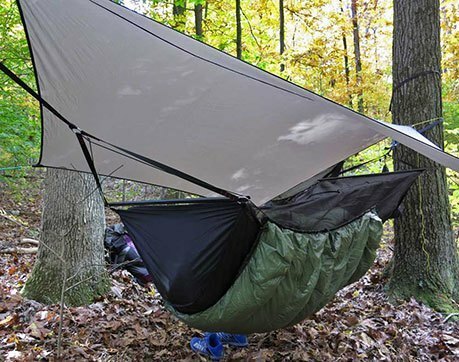 Compared to the gathered end asymmetric hammock, this type offers a flatter sleeping position and requires simple setup. Not everyone is used to sleeping in this type of hammock, though, because it can gives off a constrictive vibe. If you use spreader bars, the overall weight of the hammock can be kinda heavy; one the other hand, trekking poles can serve the same purpose just fine. Which Type Is Suitable for You? What is your purpose in buying the hammock? First of all, you need to remember that you want to buy a camping mock, not a home one. Do you intend to use it alone or want to share it with a lover? This will decide if you need a single or double hammock. What type of adventurer are you and what types of weather conditions do you most likely encounter? If you intend to go on hiking and trekking most often, an expedition hammock is probably your best choice. Such hammock comes with many extra features like bug net and rainfly to keep you safe from mosquitos, sunlight and rain. What type of build are you? Big and tall people prefer a spacious and durable hammock so they may prefer a double hammock. On the other hand, people with average height and weight can be fine with single models, which help to reduce bulk in their pack. After all, the hammock you choose should fit yoi comfortably. Do you feel constrictive when sleeping in an asymmetric hammock? If so, opt for a gathered end asymmetric hammock instead for better comfort.